A differential pressure switch is designed to sense a difference in pressure between two pressure sources in the plant for control purposes. When the pressures from two different sources in a process are connected across the sensing diaphragm, metallic or elastomeric as the case may be, the pressure difference creates a force which then overcomes that of a pre-tensioned spring and in the process moves a balancing arm or mechanism to effect the minimal movement required to actuate the micro-switch(es) of the switch. High and low pressures are applied on either side of the specially contoured sensing diaphragm. This design feature helps to eliminate errors due to a difference in area which is often a common problem present in twin element pressure differential switches. 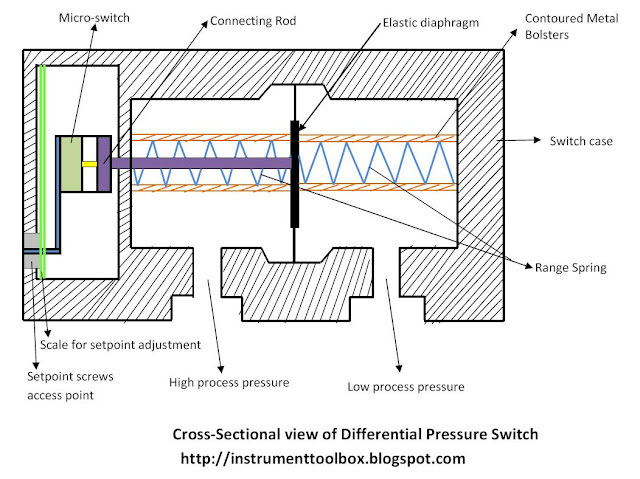 A particular design of the differential pressure switch is described below to illustrate the principle of operation. Please note that there are various variants of the switch from different manufacturers but the basic principle of operation remains the same. As shown in the diagram above, the pressure ports for high process pressure and low process pressure are separated by an elastic diaphragm. The difference in pressure that exist between the two ports causes axial movement (measuring travel) of the diaphragm against the measuring range spring. The differential pressure, which is proportional to the measuring travel, is transmitted by means of a connecting rod with little friction to the plungers of the micro-switch. The micro-switch contains the electrical contacts of the switch. The electrical contacts of the switch will actuate depending on the switch points or setpoints. Overpressure protection is provided by contoured metal bolsters for the elastic diaphragm. The adjustment of the switch point or setpoint is made by setpoint screws accessible from the front of the differential pressure switch case. The graduated scales enable a relatively accurate adjustment of the switch points and indicate the setpoint that is momentarily adjusted. In conclusion, the differential pressure switch essentially works on the basis of a difference in pressure between the high and low pressure ports. 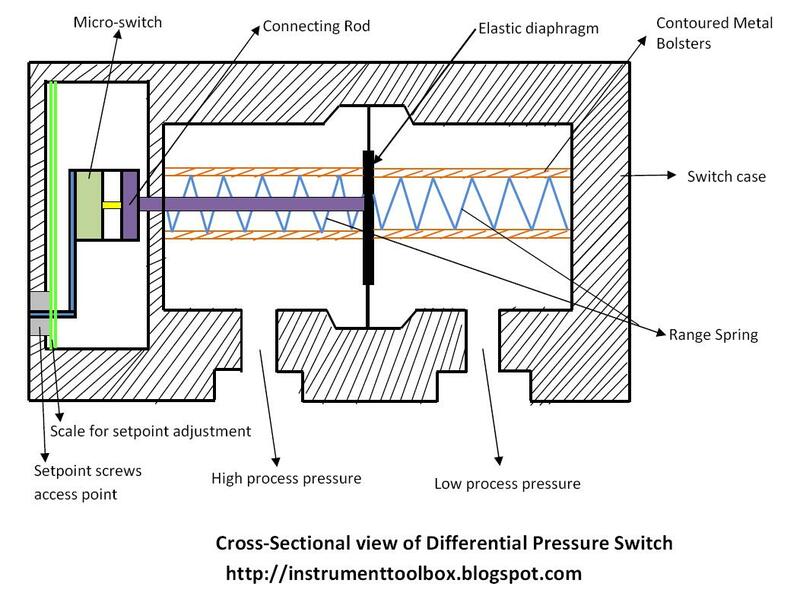 This difference in pressure is then converted into axial movement that is used to actuate the contacts of a micro-switch depending on the setpoint(s) of the differential pressure switch.